Who Did More to Win World War II, Brad Pitt or Tom Hanks? Robert Zemeckis’s Allied, which opened last week to okay reviews and lackluster box office numbers, is the latest in a long line of films about the real winners of World War II — movie stars. In this case, those stars are Brad Pitt and Marion Cotillard, and here their beauty is part of the problem: These two spies are so beautiful, they can’t see the truth in each other. But Allied is far from Pitt’s first time playing in the cinematic sandbox of the fight against the Nazis; after his recent career choices, it’s beginning to seem like it may have been the former Sexiest Man Alive, rather than Dwight Eisenhower or millions of Soviet soldiers, who played the biggest part in beating Hitler. There’s only one other movie star alive who can rival Pitt’s contributions to the Allied war effort: Tom Hanks. 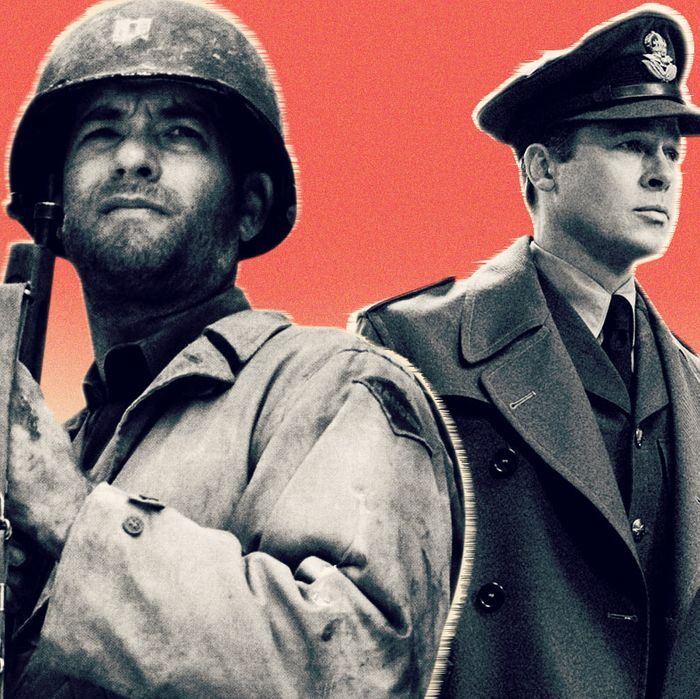 In the hopes of determining which man has truly done more to help defeat the Axis powers onscreen, we decided to compare and contrast the two actors’ performances in World War II films, awarding points where necessary and deserved. Winning the war may have been a team effort, but only one man can have first billing. The man once known as Joe Black may not have entered the war effort until recently, but he’s more than made up for his tardiness with the frequency of his missions. Pitt’s inaugural venture into World War II came in The Curious Case of Benjamin Button, in which the backward-aging hero manages to get mixed up in quite a few of the significant events of the 20th century. Button’s only real contribution to the cause is to have an affair with the British trade minister’s wife, which is not very good for international relations, nor all that productive as far as defeating the Axis powers go; however, he does manage to survive the sinking of his tugboat. We congratulate Mr. Pitt for getting in there, but it comes with a demerit for stepping out on an ally. ONE POINT. Pitt’s next movie, Inglourious Basterds, sees him really got to work. “We’re going to be doing one thing and one thing only: killing Nazis,” Pitt’s Lt. Aldo Raine, says to his Basterds, and the film definitely delivers on that promise. I’ve never tried to count the number of Nazis that are killed in this movie, but it’s apparently in the hundreds. In what you might describe as a significant level of artistic license, the Basterds even manage to kill Adolf Hitler. For the assassination of the Führer as well as a considerable amount of Nazi-killing, we award Pitt THREE POINTS (the highest possible point count). After two WWII movies in two years, Pitt took a five-year break before returning to combat in David Ayer’s Fury, where he plays a tank commander who brags, “I started this war killing Germans in Africa. Now I’m killing Germans in Germany.” Pitt’s “Wardaddy” has a more powerful haircut that Raine, but he’s not quite as funny, and a lot more gritty, mainly because he’s in a David Ayer movie instead of a Quentin Tarantino movie. He also kills a lot fewer Nazis. TWO POINTS. Now comes Allied, in which, without spoiling too much, Pitt’s character is far more interested in the home front than he is in killing Nazis, if you know what I mean. (The home front is Marion Cotillard.) For making the mistake of falling in love, he gets ONE POINT. If Pitt dirtied his hands with the blood of countless Nazis, Tom Hanks has generally taken a more strategic approach to winning the war. The sole exception is Saving Private Ryan, his only significant onscreen World War II role. (Though you could argue that once you’ve been in Saving Private Ryan, any other war movie would probably seem trivial.) In Ryan, Hanks plays Captain Miller, whose squad is tasked with saving the titular private, and the film marks the apex of the actor’s “ordinary guy pushed to extraordinary lengths” phase. Miller makes the ultimate sacrifice for both Ryan and the United States of America, and Hanks gets a full THREE POINTS for his performance, which is peak Hanks, peak Spielberg, and peak Hollywood. But just because Hanks didn’t storm Normandy again doesn’t mean he didn’t try to win the war. Following Saving Private Ryan, Hanks served as an executive producer on 2001’s Band of Brothers — which starred his non-rapping son Colin — and 2010’s The Pacific. Hanks was heavily involved in production of both mini-series, writing and directing on Band, so this wasn’t just a case of a star putting his name on a marquee project. For his contributions to Greatest Generation mythmaking, we award Hanks THREE POINTS for Band of Brothers, and ONE POINT for The Pacific. Is that it? Not quite. While Bridge of Spies, the latest Spielberg-Hanks collaboration, involved Tom Hanks helping to win the Cold War, the real-life lawyer Hanks played, James B. Donovan, was a WWII vet who helped with the Nuremburg Trials. For doing his part to help win World War II even in movies about something else, Hanks gets ONE POINT. So Who Did More to Win World War II? Even though Pitt has logged more time onscreen fighting the good fight, Hanks tops Pitt eight points to seven. And in simpler math, Hanks has two iconic World War II projects to his credit, Saving Private Ryan and Band of Brothers, while Pitt has just one, Inglourious Basterds. Sorry, Brad — when it comes to World War II, you’re the Montgomery to Hanks’s Patton. Did Brad Pitt or Tom Hanks Do More to Win WWII?